These decorative pillows are made from 100% Certified organic cotton and handcrafted in California using materials sourced in the United States. All materials are of the highest quality, grown and manufactured according to the strictest environmental standards. 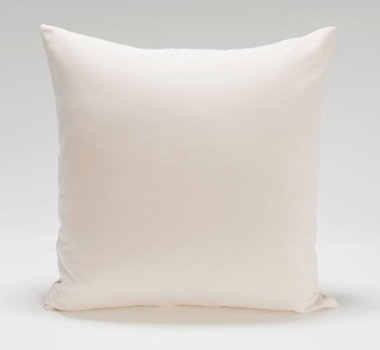 All pillows are free of pesticides, synthetic fertilizers, and irradiation. The result is a pure, natural fabric that is as healthy for you as it is for the soil, air, and water, and the agricultural community that supports its production. Everything that goes into these pillows – from he fabric to the thread to the buttons – is Made in the U.S.A. This not only ensures compliance with environmental and ethical standards, but it also means that local families and the employers who have chosen to stay on U.S. soil are supported. These oversized 22 by 22-inch pillows compliment any décor. Natural, unfinished wood button closures make them equally attractive in reverse. Each pillow comes with an organic insert stuffed with organic fibers from the kapok tree. These inserts are moisture-resistant, quick-drying, lightweight, completely hypo-allergenic, mold resistant and odorless. Moisture-resistant, quick-drying, lightweight, completely hypo-allergenic, mold resistant and odorless.